by Sr. Karen Marie Wilson, M.S. The call to the religious life is mysterious and precious. 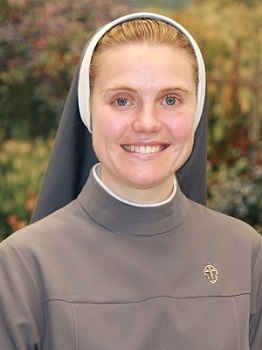 It is mysterious because there does not seem to be any rhyme or reason to who God chooses to a religious vocation, and it is precious because the one called is presented with a unique opportunity to grow in intimate union with Jesus here on earth and be a sign to others of what we all will be someday in heaven. The story of my vocation is a story of God’s mercy. I was born and raised in Lincoln, Nebraska, the oldest of three children. My parents converted to the Faith after they were married and before I was born, so I was baptized Catholic. I went to Catholic grade school and high school. I firmly believe that my vocation to the religious life was nurtured and inspired through my Catholic education and the opportunity to attend daily Mass. When I think of the kind of people God calls to the religious life, I think of saints like Therese of the Child Jesus, whose family was very pious and all the children grew up and entered religious life. That didn't seem to be me at all, and I did not feel like I was the “type” of person to receive a vocation to be a Sister. We prayed a family rosary once in a while and had Advent and Lenten devotions, but I would consider our family to be very ordinary. In fact, my parents divorced when I was in grade school so this further reinforced the feeling that I was not the type to be called. But God’s ways are mysterious and, in His great mercy, He offered me the chance to become His bride. I did not start thinking of a vocation to the religious life until I was in seventh grade. Our Lord put into my heart a great love for the Mass and all things relating to the Faith. I loved religion class in grade school! One day during Mass my seventh grade year, during the Consecration, I felt in my heart that God was calling me to live totally for Him and that I would not be happy unless I was totally His. I had a burning love for the Catholic Church, and I had an overwhelming feeling that I wanted to live in the very heart of the Church. It was a little scary at the time, I admit. I did not know, at that time, that belonging totally to God would mean being a Sister. I just knew I wanted to live only for Him. It was not until I reached high school that I questioned if God was calling me to be a Sister. When I turned sixteen and had a car, I drove to daily Mass and went to adoration at the Pink Sisters in Lincoln. I prayed and tried to listen to what God wanted of me. I sought to develop a strong prayer life and a deep devotion to our Heavenly Mother. I never did ask for any big signs from God instructing me in my vocation. I guess I just knew deep in my heart what He wanted of me and I said “Yes!” Sure, I asked for little signs once in a while, but even when they were answered, I knew that I would have known my path even if I didn't get a “sign.” God speaks to the heart. We need to be in silence to hear his voice and also courage to follow God’s will once it has been manifested. One thing is for sure—God’s plan for our lives is more exciting and fulfilling than anything we would chose for ourselves. We can put our trust in Him! He knows what He is doing and if he begins a good work in us, He will bring it to completion (Phil 1:6). God’s mercy is endless and in His great mercy, He chose me to follow Him in the religious life. He called me to be a Marian Sister and travel my pilgrim path towards heaven with the other members of my Community. If you are a young person discerning your vocation, I would like to tell you not to be afraid of what God may ask you to do with your life. You are made for a particular vocation and you will not be as happy unless you follow the path God marks out for you. Whatever God asks of you, I promise it will be exciting and fulfilling.